Where did I buy it? How did I season it? I’m not saying a word (yet) but know this: you can learn everything you’ve ever needed to know about buying and seasoning your first wok by purchasing Grace Young’s fantastic book, Stir-Frying To The Sky’s Edge. 1. 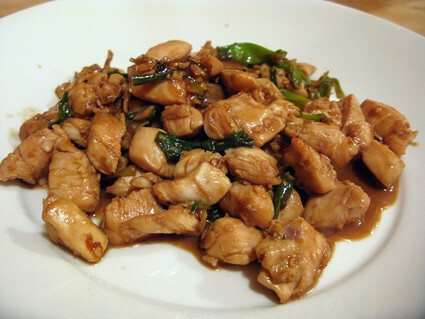 In a medium bowl combine the chicken, 2 teaspoons of the dark soy sauce, 1 teaspoon of the soy sauce, 1 teaspoon of the rice wine, sugar, cornstarch, ground Sichuan peppercorns, and salt. Stir to combine. In a small bowl combine the sesame oil and the remaining 2 teaspoons dark soy sauce, 1 teaspoon soy sauce, and 1 teaspoon rice wine. 2. 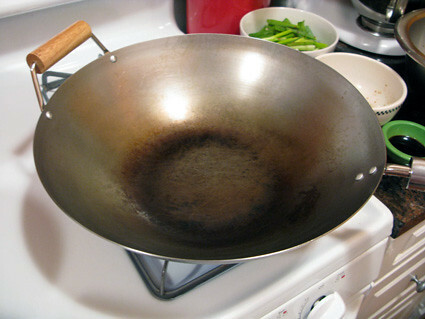 Heat a 14-inch flat-bottomed wok or 12-inch skillet over high heat until a bead of water vaporizes within 1 to 2 seconds of contact. 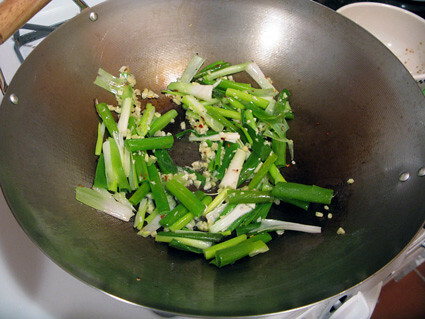 Swirl in the peanut oil, add the scallions, ginger, garlic, and red pepper flakes, then, using a metal spatula, stir-fry 10 seconds or until the aromatics are fragrant. 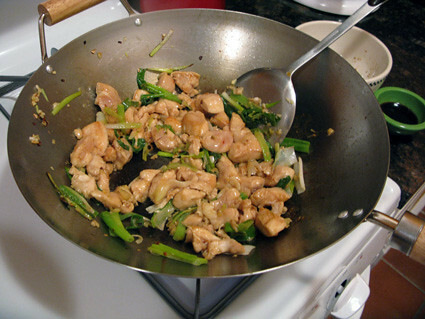 Push the aromatics to the sides of the wok, carefully add the chicken, and spread it evenly in one layer in the wok. Cook undisturbed 1 minute, letting the chicken begin to sear. 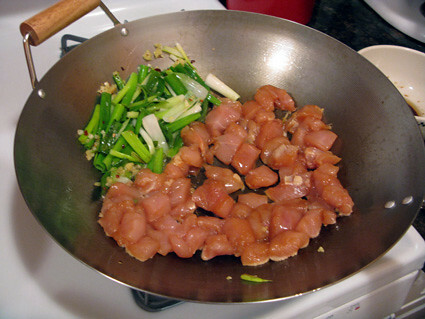 Then stir-fry 1 minute or until the chicken is lightly browned but not cooked through. 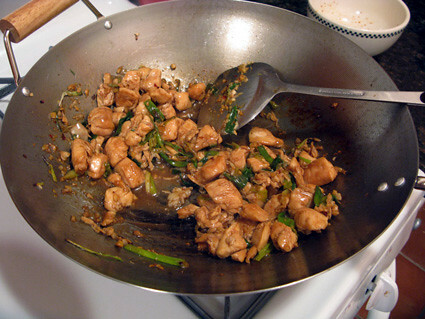 Swirl the soy sauce mixture into the wok and stir-fry 1 minute, or until the chicken is well glazed with the soy sauce. Swirl in the vinegar and stir-fry 30 seconds or until the chicken is just cooked through. Serves 2 as a main dish with rice or 4 as part of a multicourse meal.